May 7, 2010, 4 p.m.
By Megan Garber @megangarber May 7, 2010, 4 p.m. The Tumblr’s fate is, at the moment, as precarious as that of its parent magazine. But it’s worth noting that, even as Newsweek, as a magazine and a website, got a reputation for mediocrity and stagnancy — and even as, yesterday, all the familiar they failed to innovate truisms came out in full, schadenfreudic force — over at the outlet’s Tumblr, innovation (and experimentation, and engagement and conversation) were actually taking place. Just on a small scale. “The nice thing about management is that they’ve been very much like, ‘Experiment. Do whatever you want. Don’t embarrass us too much. And see how it goes,'” Coatney says. The institution gave agency to one of its members to experiment with something he cared about; it gave him leave not only to leverage his expertise, but also simply to have fun as he leveraged. The groking and the rocking, rolled into one. POSTED May 7, 2010, 4 p.m.
Garber, Megan. "Say what you will about Newsweek…but don’t forget about their Tumblr." Nieman Journalism Lab. Nieman Foundation for Journalism at Harvard, 7 May. 2010. Web. 25 Apr. 2019. Garber, Megan. "Say what you will about Newsweek…but don’t forget about their Tumblr." Nieman Journalism Lab. Last modified May 7, 2010. 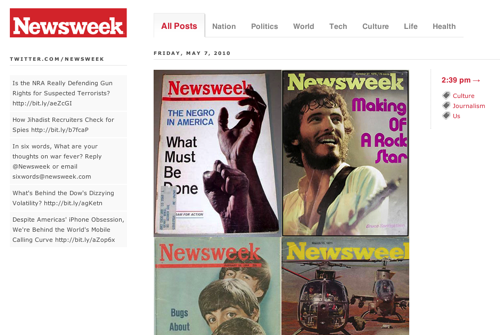 Accessed April 25, 2019. https://www.niemanlab.org/2010/05/say-what-you-will-about-newsweek-but-dont-forget-about-their-tumblr/.